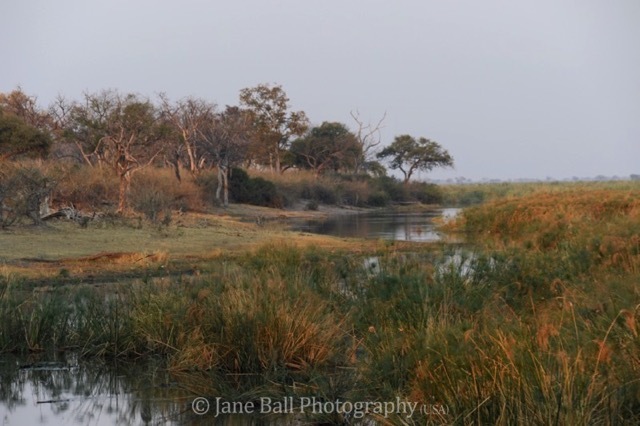 Editor’s Note: Jane Ball is a world traveler, and has some incredible photos at her website: www.janeballphotography.com. 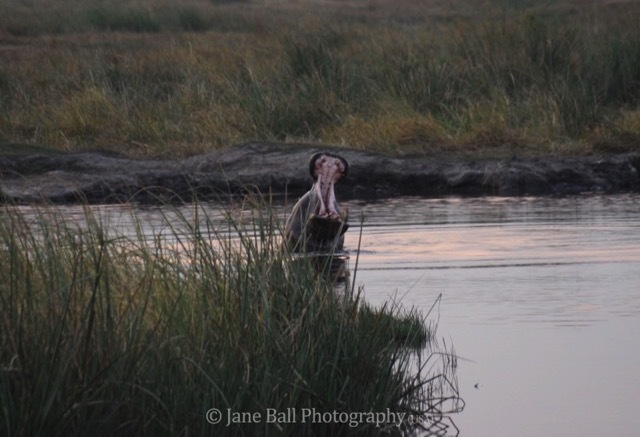 This is the second of a two part series, written by Jane, about her latest trip to Botswana. Our final camp had tented cabins built on pillars and connected by a boardwalk about eight feet in the air. At this camp, there were palm trees whose ripening nuts the elephants loved. One night, an elephant broke through the boardwalk to get to some of these palm trees. Early the next morning, I realized the elephant was near my tent eating the nuts. I looked through the screen window, and the elephant’s head was right in front of me, only a few feet away. I watched it put the length of its trunk against the palm tree, tusks on either side of the tree, and using its whole body, shake the palm tree until the nuts fell down crashing on the boardwalk. Fabulous! Elephants are big and strong, and for the most part, they get what they want. Elephants are really tough on trees. In addition to rubbing and scratching on a tree to the point of uprooting it, they will eat everything right down to the nub. After they have eaten every leaf and most of the branches, they will use their tusks and their feet to dig up and eat the roots. 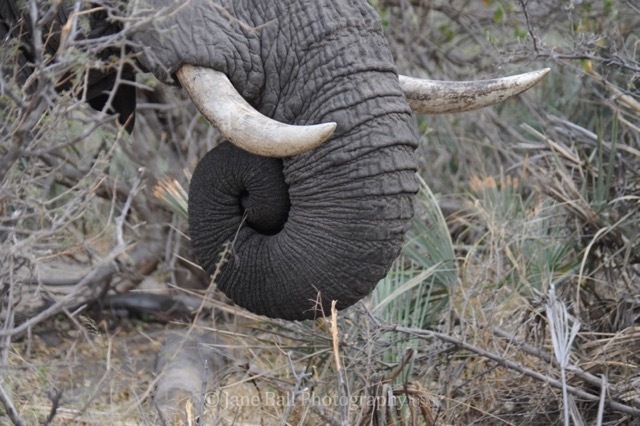 Elephants have six sets of molars during their lifetime. As one wears down, due to continual grinding, another one moves in to take its place. When elephants are younger, they’ll eat the biggest and toughest pieces of wood. As they get older they will eat smaller, finer branches because they don’t want to wear down the last set of molars they have. Once those molars are gone, they starve to death. Hippos also pretty much get what they want. We think of hippos as dancing in tutus. They don’t. They spend most of their time in the water but come on shore at night to eat grass. 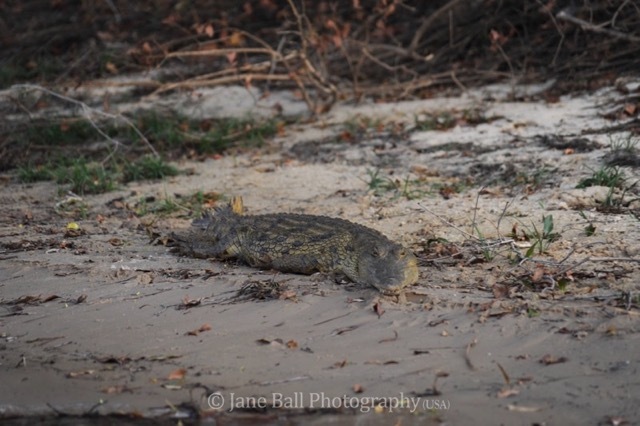 There are a lot of hippos in the Okavango Delta, and I heard them grunting and rumbling day and night. Usually all you see are ears, eyes and a nose, unless they are irritated. Then you see a great gaping maw, which is not a yawn, but a threat. 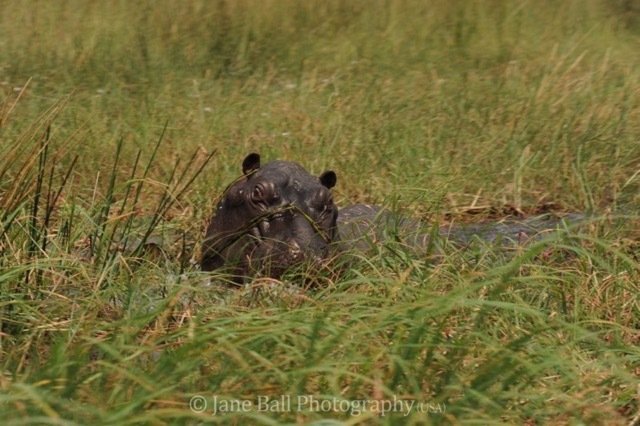 If you are in a boat and get too close to a hippo, it will be unhappy with you. It will open that giant mouth and with those giant teeth, clamp down on the boat and possibly bite it in half. If the boat is too big, it will attempt to climb up into the boat until the boat capsizes. Then, if the hippo doesn’t bite your head off, the crocodiles will get you before you reach shore. I have so many stories from this trip. More than any other, this trip impressed me with nature’s life-death continuum–the lion killing the cub; the zebra stallion trying to kill another stallion’s foal; the elephants eating the trees to death; the eagle catching the fish and pinning it to a branch with its talon; the bird catching the frog and beating it to death on the branch before eating it; the gecko on the tent wall catching and eating the moth. It’s all happening, all the time. The first time I went to Africa, I went as an entitled American, fairly certain that nothing would hurt me. This time, I came home grateful for the doors on my house, the food in the grocery store, and the animal that lives with me that lets me hug him and would never think of eating me. 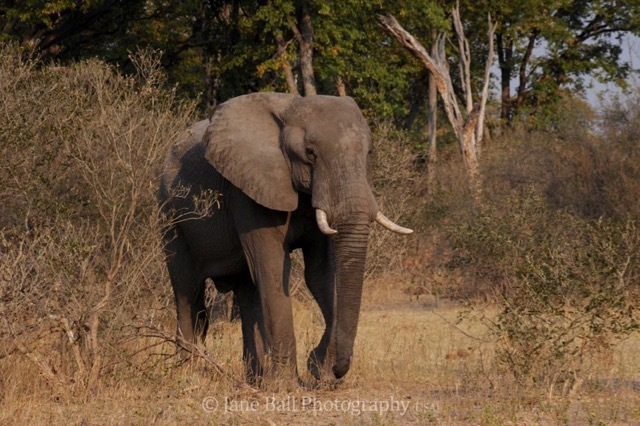 But make no mistake–I love Africa, and I can’t wait to go back. 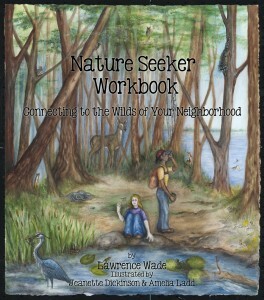 This entry was posted in Connecting to Nature, Mammals. Bookmark the permalink. You may lose your life in Africa but it can be more dangerous watching TV at home because you also lose your soul!